Whether you are looking for an exclusive designer frame , a practical traditional style or even a pair of sports glasses to help you attain sporting greatness, Thomas H. Collison (Opticians) offer an extensive range of high quality spectacles at realistic prices. 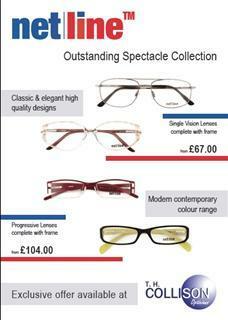 Our frame ranges are on open display in our bright, convenient and modern practices, where you can try on different styles in a calm relaxed atmosphere and where our experienced staff will be happy to assist you in your choice of frames and then advise you on the best lens choice to give you optimum visual comfort. For more information on our ranges uses the links opposite or call into your local branch where you will receive a warm friendly welcome and practical advice.